Being able to have a television even when sailing is by now a reality, technology offers us numerous resources such as aerials that can automatically search for the satellite, update tracking data and so on. On board the best solution for screens is definitely that offered by liquid crystal technology, as it offers screens that, due to the lack of a cathode ray tube, take up very little room and can be positioned anywhere. Sharp proposes a range of colour TV's called Aquos featuring a design that can be integrated in any kind of setting. 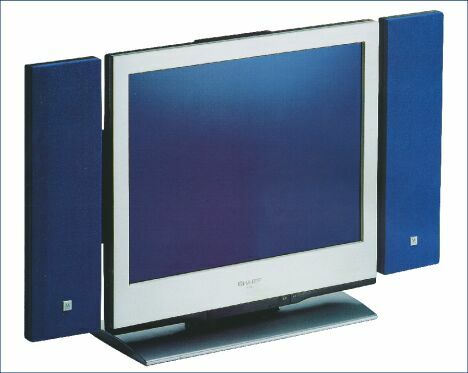 These are high resolution 921,600 pixel LCD screens, active matrix LCD panel with Black TFT technology, multisystem tuner, teletext, high luminosity, and vivid colour reproduction thanks to a colour temperature of 9,000°K, 5.2 W power stereo audio socket, on screen menu in seven different languages and removable table support. The screen measures 19.7" and the bulbs that power it, ensures Sharp, last at least 40,000 hours. Among the reasons making crystal liquid apparatus more suitable for use at sea compared with conventional tube versions is also their capacity for decidedly lower electricity consumption, approximately half; if to this we add more faithful and better defined reproduction and a screen that is only 58 mm thick, it is easy to understand the reasons behind the success of this technology. Sharp offer the Aquos line with diffuser grids in three different, interchangeable colours, in order to adapt the screen to any kind of furnishing. For further information you can contact Sharp electronics Italia; via Lampedusa 13; 20141 Milano; tel. 02 895951; freephone 800 826111; website www.sharp.it; e mail marketing@seis.sharp-eu.com.